Explore the highlights of Switzerland in 11-days! Begin in atmospheric Zurich and Lucerne, then on to Mt Pilatus to which you rise on the world's steepest cogwheel train. Then explore the traditional resort town Interlaken and make your way to the 'Top of Europe', Jungfraujoch, on a cogwheel train. Continue to Lausanne region where you visit the Chillon Castle and travel on the tasty Chocolade Train. As a grand finale experience the top sights of Geneva. After breakfast, you meet your private guide in the hotel lobby and enjoy a perfectly-planned sightseeing tour around the most beautiful landmarks of Zurich. After the tour, you return to the hotel and have the rest of the day at your leisure. This evening join a group to take a trip around the most famous gastronomical places in the Zurich area. At first, visit the chocolate factory Lindt & Sprungli and enjoy a ride on the aerial cable car ride. When you reach the hilltop station Felsenegg, go to a restaurant overlooking Lake Zurich, where you enjoy the great view and taste a glass of wine or Gluhwein, then continue to another traditional restaurant to try a freshly prepared chocolate dessert and natural cheese fondue!Felsenegg, go to a restaurant overlooking Lake Zurich, where you enjoy the great view and taste a glass of wine or Gluhwein, then continue to another traditional restaurant to try a freshly prepared chocolate dessert and natural cheese fondue! Following breakfast, you check out from the hotel and head to the railway station for a train ride to Lucerne, set amid beautiful snow-capped mountains on Lake Lucerne. Upon arrival, you go to your centrally-located hotel (easily accessible on foot) for check-in. Following breakfast, you check out from the hotel and go to the station on your own. There you take the Luzern-Interlaken Express. In about two hours you arrive at the Interlaken railway station, from where you can easily reach your centrally-located hotel on foot. You can take an interesting walk through the Ice Cave where everything around you is made from ice. The area includes several restaurants, cafés, and shops as well as a place for snow activities to satisfy any taste. Today after breakfast you check out, go to the station and board a train which takes you to the next destination (you have 2 train transfers on the way). Within about an hour you reach Montreux located on the shores of Geneva Lake and known as 'Swiss Riviera'. Upon arrival, you go to your hotel for check-in. 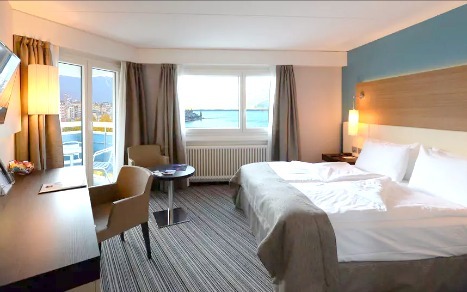 The rest of the day is free for you to have rest and to spend time enjoying views of Geneva Lake. Today prepare for a day of delicious touring! Following breakfast, you board the Chocolate train to start your trip to Gruyeres. Onboard you are treated to chocolate croissant and coffee. Your first activity today is a tour of the cheese factory La Maison du Gruyere, where you learn about cows, milk, and cheese making process; multilingual headsets are provided for you. Then you take a short bus trip up to the Gruyeres village. There you have 2.5 hours on your own so you can spend time visiting the Gruyeres Castle dating back to the 13th century (entrance ticket is not included), tasting world-famous Gruyere cheese or just strolling along medieval streets. Next on your list is the tour of the legendary Maison Cailler Chocolate Factory in Broc where you are transferred by bus. Here you learn about the history of these tasty sweets and discover the secrets of Swiss chocolate production. Your visit is commented in English, and right after the tour, you are invited for chocolate tasting. After you return to your hotel in Montreux by Chocolate train, the rest of the day is free. After breakfast you take a public boat cruise on Lake Geneva to reach the most recognizable historic monument in Switzerland - Chillon Castle which dates back to medieval ages. Its charming architectural style and rich history inspired such literary geniuses as Victor Hugo, Jean-Jacques Rousseau and Lord Byron. First you admire the exterior of this historical monument from water. Upon disembarkation you have a private guided touring around the most spectacular parts of Chillon Castle. Following Chillon you head for Montreux where you meet your guide and have a private walking tour. You learn about the history and culture of charming 'Swiss Riviera' strolling along the lake shores where the summer Jazz Festival takes place. On the way up to the old town you enjoy stunning views of the lake and pass by the oldest house in Montreux, dating back to the 16th century. After the tour you return to your hotel. The rest of the day is free. Today following breakfast you check out from your hotel and proceed to the train station for a train ride to Geneva, surrounded by the Alps and Jura mountains. Geneva is the second most populous city in Switzerland and the capital of the Republic and Canton of Geneva. Upon arrival, you check in to the hotel, leave your luggage and start a 3-hour walking tour. You start discovering Geneva sights by the lakefront. You see one of the most famous landmarks, the Jet d'Eau fountain of 140 m (460 ft) and enjoy the view of the mountains. After you proceed to the astonishing Old Town and see St. Peter Cathedral, Reformation Wall, the English Garden with Flower Clock, Ile Rousseau and Castle Tour-de-l'ile. Finally, you take advantage of your public transport pass to view the international district of Geneva and its heart - United Nations Office located in the Palace of Nations. After the tour, you return to the hotel and enjoy the rest of the day at leisure. This is the final day of your tour. Following breakfast, you check-out from the hotel and your driver takes you to the airport for the departure. We wish you a safe flight and hope to work on your future vacations! Optional extension: You may extend your stay in Geneva. Please contact your travel specialist for details.